This bit of knowledge will probably come as a shock to many people: Operating systems were invented to make using a computer easier. It's true. Without an operating system, access to any peripheral, even the keyboard and the monitor, would be impossible. But the knowledge that things could be worse than they are is little comfort to the user with writer's cramp from typing endless paths for a simple file duplication. Or for someone who's stashed a file somewhere on their hard drive—but only DOS knows where. A 30MB hard disk can easily contain 100 subdirectories. Keeping track of all the subdirectories on an 80MB or larger hard disk can drive even an organized mind to distraction. DOS comes equipped with commands that copy, delete, and rename files. Other commands let you create and remove directories and subdirectories, which is crucial in organizing a hard disk. But DOS is inadequate when it comes to tracking files and subdirectories. Given DOS's awkwardness in file management, it's little wonder that shell programs have been so enthusiastically embraced. With a DOS shell, you don't have to type complex commands to perform simple procedures such as copying files from one subdirectory to another. You don't even have to know DOS commands to run a shell. You just point to subdirectories displayed on the screen and quickly step through lists of files. The combination of a mouse with a DOS shell virtually eliminates the use of the keyboard in issuing commands. As the market for DOS shells grew, new entries into the field proliferated. There are now literally dozens of good DOS shell programs. With so many available, how can you be sure to select the right one? First, a good DOS shell will help you perform almost any file-maintenance function with point-and-shoot simplicity. It also should let you view the contents of text files, see hidden files, run application programs, and easily access DOS itself. It should feature a function that tracks down files anywhere on your hard disk, by name or through the use of wildcards. The best shells provide simple text editors so you won't have to start your word processor each time you need to examine or edit a batch or a text file. If your computer is ever used by people who aren't particularly computer literate, you should look for a shell that allows you to set up customized user menus. This way you can custom design your computer so the necessary programs are only a menu selection away. You should also consider the size of the DOS shell you buy. There should be a comfortable balance between the features you want and the amount of space available on your hard disk and RAM in your PC. It's not worth much to have every DOS shell feature known to man if the shell that provides them takes too big a bite out of your storage. The way to find the DOS shell that meets your needs is to take a look at some of the best examples of these programs yourself. You may find you don't want any of the most popular shells, but a quick look at the features they offer will help you consider the remainder critically. Although a number of DOS shells have become available, three names are always mentioned in any list of the best and most desirable programs: Tree86, Xtree, and The Norton Commander. What follows is an in-depth look at each of these shells. One of them could well be the shell for you. This is one of the smallest, fastest DOS shell programs you can find. Tree86 Plus takes up so little disk space that I had no problem running it on my dual-floppy laptop PC. It's powerful enough, however, to handle most of the hard disk management chores you'd expect from a much larger program. As with most DOS shells, you can highlight any directory or subdirectory on Tree86's onscreen graphic display of your hard disk's tree structure in order to see the list of files in the directory. Lists of files can be sorted by name, date, size, and more. It's easy to move quickly up and down the file list, tagging or untagging files with the press of a single key. Tree86 also features a fuzzy sort. All it requires is that you type a letter (or a string of letters), and all the files whose names contain that letter will appear at the head of the list of files. Once you've tagged a file or group of files, you can erase, copy, move, rename, back up, or alter them by selecting the proper option and then selecting the target directory from the onscreen file tree. Tree86 does the rest. Directories themselves can also be moved, renamed, created or deleted. Here's a humorous argument against DOS shells from our resident devil's advocate. I think shells are for the birds. I've never been lost in DOS, and I don't know anybody who has. Lest you think I'm just some hide-bound curmudgeon throwback, let me assure you I'm quite the opposite. I see the command line as the brave new world, the frontier where human faces machine on the cutting edge. By comparison, the shell is a buffer between the user and the machine, isolating you from the need to understand DOS and the computer. If anything, the shell is a throwback to an earlier era, and the language of shells gives this fact away: You aren't interacting on the command line, you're clicking on the desktop, like a bored executive with a new ballpoint. True command line rangers don't venture out unprepared anymore than a pioneer would wander into the forest without an axe, a bear gun, a flint, and some jerky. There is a basic tool kit anyone can throw together that takes the edge off life on the frontier. First of all, to keep from getting lost, use the PROMPT command. There are about a dozen things you can include in your prompt, but the most useful is $P. The command PROMPT $P places your path in the prompt, so when you're in your document directory, under your word processing directory—which is right off the root directory—your prompt reads C: \ WP \ DOC. No need for a compass when you have directions that clear. This would make a good addition to your AUTOEXEC.BAT file, if you don't already have a prompt command. It changes the directory to my word processor directory, runs my word processor, and then returns to the root directory when I quit using the word processor. I have these commands in a file named WP.BAT in my \DOS subdirectory. In order that DOS will know where to find WP.BAT, I put my DOS directory on my path. That way, just typing WP anywhere in the system takes me instantly to my word processor. What's a path? It's like trail blazing for your computer. It tells the computer where to look for important programs and files. Generally, most people can get along with simple path like PATH = C: \ ;C: \ DOS in their AUTOEXEC.BAT file. When the computer is looking for a file, the path tells it to look first in the root directory, and if the file isn't there, to look in the DOS directory. Anytime you want to add another subdirectory to your path, just put in another semicolon and add the directory's name. Remember to put the PATH command in your AUTOEXEC.BAT file; it makes sure the path is set each time your computer boots. What else do you need in your saddle bags? A good command line retriever like STACK, found in the January 1989 issue of COMPUTE! 's PC Magazine. This lets you recall old commands for editing and reissuing, which streamlines the command line. You could probably do with a good directory program, too. You'll want something that provides more information onscreen than the standard directory—something like Superdirectory or D45, also from previous issues of COMPUTE! 's PC Magazine. Some other tools you might like to learn are the COPY CON command, the EDLIN text editor, and the ASSIGN statement, which simplifies directory access. These are all tools you can use on the run, like a fast horse and a Remington Rolling Block. Some people say it's wanderlust that drives us into the wilderness, but it's really civilization biting at our heels, trying to tell us what to do and how to do it. You don't need some anonymous programmer telling you how to run your computer. You can tame that DOS beast without a shell. All you need are the right tools and the intestinal fortitude to use them. The shell provides a display of total system memory (including extended and expanded memory), the amount of memory used, and amount of free memory still available. Tree86 can be used to set file attributes on entire groups of tagged files, making them into hidden files, for example. Like most DOS shells, Tree86 will let you view text files, and it will let you edit them with your own text editor or EDT, the editor provided with the program. One powerful feature I've used often is searching an entire group of tagged text files for a specified text string. Tree86 will search all the files and untag those that don't contain the string. This is a great way to search your word processing files for letters to a particular client or for chapters in a multifile document that relate to a specific subject, for example. Tree86 allows you to treat a subdirectory as if it were a single file: You can copy an entire subdirectory into a different directory with a single command. This shell doesn't display two directories or subdirectories side by side—something that's very useful in a DOS shell. However, the Tree86 makes up for this shortcoming by allowing you to move and copy files to a previously selected target directory with a single keypress. For diehard fans of the venerable DOS C> prompt, Tree86 offers Tree-DOS. This is a special version of DOS you can enter with a keypress. This command line operating system will allow you to perform whatever standard DOS operations you wish to carry out. You can return to Tree86 using another single-key command. Tree86 Plus also includes Aldridge's Cache86 program, a memory-cache package. Xtree has become a major competitor in the shell field. Xtree Pro Gold, the latest version of Xtree, is large. It's shipped on two floppies with a collection of utilities and programs that can do amazing things. For example, you're allowed to see what your computer is up to: Xtree Pro Gold splits the screen in two, making it easy to view two different directories or subdirectories at the same time so you can mark files in one and move or copy them to the other while you watch the action. Xtree Pro Gold's unique ability to log up to 26 disk drives at the same time can help you with disk-wide searches and file operations. The program's Archive feature allows you to combine and compress files—even entire directories—into archives. When you restore the files from an Xtree archive, the program recreates the original file structure. This can save a lot of space when backing up whole directories—or even a complete hard disk—to floppies. This shell allows you to view files created with Lotus 1-2-3, dBase, Word, WordPerfect, WordStar, and MultiMate, eliminating the need to start the application to see what's in a file. You can easily run applications from the shell, however. To run an application, simply point to its name in any directory and then press Enter. Or you can create custom application menus, giving your PC complete point-and-shoot compatibility for users who never saw a DOS prompt before in their lives. These menus can display the names of any applications software you normally run. The user can simply point to a program he or she wishes to run, and Xtree Pro Gold will switch to the proper subdirectory, load the program, and run it. It's like turning your entire computer into a single menu-driven software package. You can also set up the shell to automatically load a program when you point to a data file created by the program and press the Enter key. It can be set, for example, to recognize all files with an extension of DOC as word processing files. Then, whenever you point to a file with a DOC extension and press Enter, Xtree Pro Gold automatically runs your word processor and opens the selected data file, ready to edit. This works equally well with databases, spreadsheets, or other programs that generate data files. One particularly impressive feature is Xtree Pro Gold's ability to recall up to 15 responses for every operation or command that requires text entry. This allows you to simply select responses to commands from a list of past responses, rather than reentering them from the keyboard again and again. Shells often come with additional applications that make dealing with files easier. Xtree's 1 Word is a word processing program that comes with the shell. It's a good deal more than a stripped-down text editor. Although easy to use, 1 Word has so many features that it comes with its own manual. You can use it to perform block maneuvers and search-and-replace functions, set up programmable function keys, and even create graphics within 1 Word text files. Xtree Pro Gold will edit binary files, too. This gives you a lot of the power of The Norton Utilities, allowing you to enter program files and change them to suit your needs. But be careful! If you start tampering randomly with program files and you don't know what you're doing, all kinds of unpredictable things could happen when you try to run a program you've altered. Like Tree86, Xtree Pro Gold lets you graft a subdirectory, moving it to a different parent directory in a single operation, and prune a branch of a directory, deleting all subdirectories and files contained in the pruned directory. Xtree Pro Gold does so much, in fact, that you might wonder how you could possibly need anything else. But remember: The principal drawback is the program's overall size. Xtree Pro Gold occupies almost a full megabyte of space on a hard disk and won't run at all under anything less than DOS 3.1. You simply can't run it on a floppy-based computer, even with large-capacity floppies. Peter Norton revolutionized the PC world when his company released The Norton Utilities. This collection of DOS software tools has become the standard by which other general-purpose DOS utility collections are measured. It has even established standards by which PCs themselves are measured. The same thing happened to DOS shells when The Norton Commander was first released in 1986. Other DOS shell publishers struggled to catch up after the first Norton Commander hit the streets, making file viewing, user-configurable application menus, file-finding, and extensive search capabilities standard features on their systems, too. Some DOS shells also outpaced Norton Commander when they upgraded, but it didn't take long for Norton to catch up. 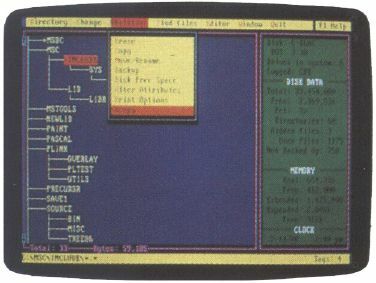 Norton Commander version 3.0 features a revamped user interface with pull-down menus, in addition to the program's collection of familiar keyboard commands. You can now select filenames with wildcards, set file attributes, alter the mouse speed and even set your mouse for left-handed operation. Files can be copied using the directory tree display to specify target directories or subdirectories. Directories of files are automatically displayed as you move the highlight bar up and down the tree display. So much for playing catch-up. But Peter Norton wasn't satisfied with merely staying with the status quo. Norton Commander's view capabilities have been expanded almost beyond belief. The program will now display and search database, spreadsheet, or word processing files created by any of 29 popular programs in addition to working with straight ASCII text files. It comes with its own text editor and will also display PCX graphics files created with programs such as PC Paintbrush or most PC desktop publishing packages. To make sure other publishers would have to play catch-up all over again, Norton Commander 3.0 also includes Commander Mail (a full-featured telecommunications program) and Commander Link (a special laptop-to-desktop file-transfer program). All of these capabilities have been added to the already extensive list of Norton Commander functions. The program still displays two directories or subdirectories at the same time, and you can still easily change file listings to include only the filenames themselves or full listings of each filename, including its date and size. You can still create customized user menus for your system, automatically activate applications by pointing to their data files, and much, much more. Norton Commander 3.0 is more powerful and flexible than ever but, like Xtree Pro Gold, it grew in size. The new Norton Commander nearly fills two 5¼-inch disks and requires some hefty storage space on your hard disk. It will run under DOS 2.0 or above. Norton Commander is fully capable of handling almost any hard disk maintenance need and more. It could even eliminate the need for a telecommunications program or laptop-to-desktop file-transfer utility. If disk space is a premium, you will want Tree86 Plus or a similarly compact program. Remember, however, that this program lacks the split-screen directory offered by many shells. 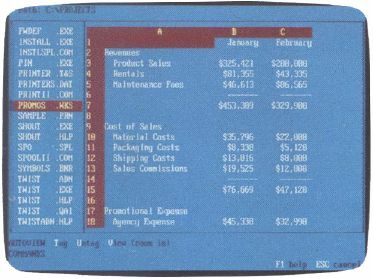 If you use large numbers of spreadsheet, database, or word processing screens, you'll probably want to consider The Norton Commander for its ability to view a wide variety of those files. Most other shells will be a long time offering the breadth of coverage Norton has supplied with its shell. If you work primarily with text files, either from a word processor or a compiler environment, Xtree Pro Gold's 1 Word will have to impress you. Having a quick text editor online can be a lifesaver sometimes. Also remember that this program and The Norton Commander allow you to start an application by clicking on the name of a file created by it, similar to a Macintosh application. Xtree Pro Gold may have the edge on the others in terms of power, but remember that it's more difficult to learn and use. Mouse support seems to have been added as an after-thought, and it isn't used at all in 1 Word. Screen color may seem a minor point, but if you're interacting with a shell several hours a day, it becomes important. Tree86 Plus and Xtree Pro Gold each allow their colors to be changed. 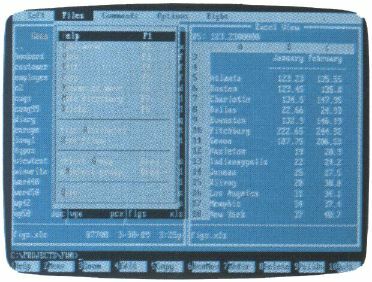 The Norton Commander only allows you to select among a preset, unadjustable color screen, a black-and-white screen, and a special screen intended for laptops. Keep your eyes open for other shells. The woods are full of fast, capable operating environments for the PC. But, if you're like thousands of others, you'll find what you need among these three, and the decision will probably depend almost entirely on the system you're running and the files you use.